Belly fat can make the waistband of your pants uncomfortably tight and leave you feeling self-conscious in a bathing suit. Classic weight-loss strategies help slim your middle so you feel more confident, but you'll have to be a little patient. A safe rate of weight loss is just 1 to 2 pounds per week, and you can't guarantee all that fat will come from your abdomen. Quick efforts to lose weight are often unsustainable, lead to the loss of valuable muscle and potentially endanger your health. For safe weight loss, commit to a long-term program that combines healthy eating with simple exercise moves to conquer the battle of the bulge once and for all. Belly fat consists of two different types of fat: The firm fat that expands your waistband is visceral fat, which nestles around your internal organs and raises your risk of health problems. Visceral fat causes your body to release more of the stress hormone cortisol and compounds known as cytokines, which raise inflammation and negatively affect your production of insulin. As a result, you're overweight and at greater risk of obesity, heart disease, type 2 diabetes and some cancers. The soft, pinchable fat at your belly is subcutaneous fat and is less of a health issue, but makes your clothes tight and your tummy look pudgy. Visceral fat is some of the first fat you lose when you embark on a weight-loss program, but subcutaneous fat is more stubborn and may take a little patience. Exercise is particularly important for belly fat loss — but not crunches and twists. 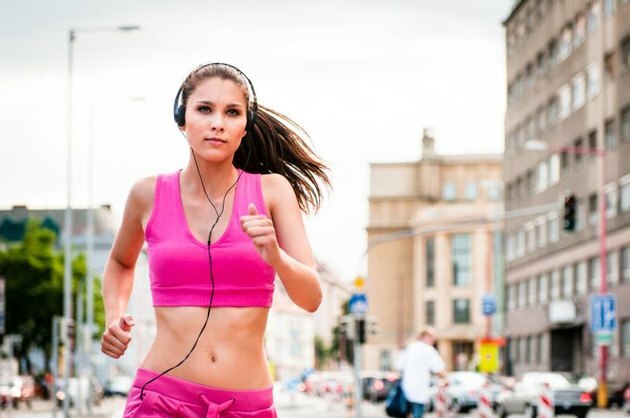 You're more likely to whittle your waist with high-intensity cardio and intervals. Cardiovascular exercise uses the big muscle groups for an extended period of time to raise your heart rate and build up a sweat. Cardio helps shrink your belly because it burns more calories than targeted abdominal exercises. When you burn more calories than you consume, your body converts the stored triglycerides from fat cells into usable energy, so you lose weight. You can't dictate which fat cells your body uses for such energy, but visceral fat is usually among the first because it's so metabolically active. Easy, do-anywhere activities that count as cardio are jogging, cycling, dancing and simple fitness class moves, such as burpees and jumping jacks. Go at a high intensity to lose belly fat. A study published in a 2008 issue of Medicine and Science in Sports and Exercise showed that, after 12 weeks, women who exercised at a high intensity three times per week and at a low intensity two times per week lost notably more belly fat than women who stuck to a low-intensity all five days. After several weeks of cardio, add intervals to one or two of your weekly sessions. This involves alternating short bouts of all-out effort with equal bouts at a lower intensity — for example, alternate sprinting and walking. This approach improves your body's ability to burn fat and lowers insulin resistance, reports a paper published in a 2011 issue of the Journal of Obesity. 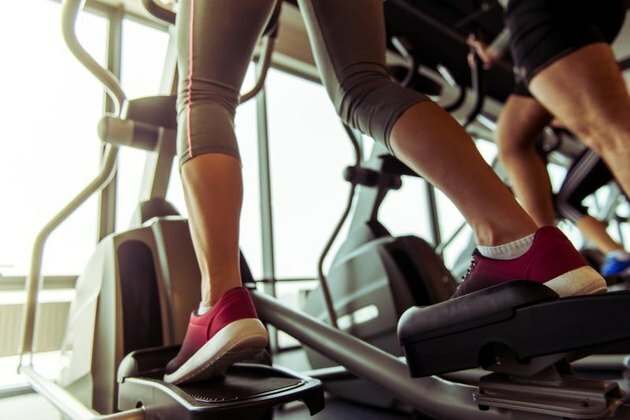 Add intervals simply after you warm up; speed up your chosen mode of cardio for a minute or two and then slow down to an easy pace for a minute or two. Alternate for 20 to 30 minutes and cool down. Intervals are intense, but time efficient, so a busy woman can slide them easily into her schedule. 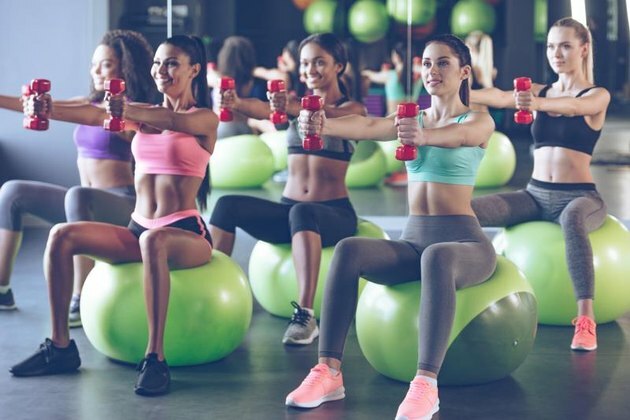 A comprehensive, total-body strength-training routine doesn't burn as many calories as a cardio session, but it helps develop muscle over your whole body — rather than one area. Muscle burns more calories at rest than does fat tissue, so your metabolism increases when you are more muscular. This means you burn more calories all day so losing weight and belly fat is easier. Strength training also helps keep extra belly fat away. A study published in a Obesity in 2010 showed that regular resistance training prevented regain of visceral fat a year after women lost the weight through a low-calorie diet. Strength training exercises don't have to be complicated. Just one set that includes eight to 12 repetitions of straightforward exercises such as push-ups, squats, rows, biceps curls, triceps dips and lunges targets just about every muscle group. Do this routine twice per week. Once 12 repetitions are easy for you, add weight. Use dumbbells, barbells, resistance bands or household objects. Hold a heavy box of laundry detergent as you squat or fill an empty milk jug with water for biceps curls, for example. A few easy core exercises included in your routine build muscle in your abs so that when you do slim down, your abs look more defined and tight. Planks are some of the easiest ways to develop strength throughout your core. For a basic version, get into the top of a push-up position and hold. Draw your belly in towards your spine to maintain a rigid back. Start with 20 to 30 seconds at a time. Work up to a minute or longer as you become stronger. The Pallof press is another simple move you can easily learn and execute. Wrap a long resistance band around a stable pillar so that it's at your chest height — or use the pulley machine at the gym and lower the handle to chest height. Turn one side of your body toward the pillar or cable and walk out until you feel slight resistance. Hold the handle in both hands at the center of your chest and push straight out in front of you. Pause for a second or two and carefully return the handle to your chest. You build strength by resisting rotation toward the cable.